Not written anything for ages. Hope you still come back to read. My feet have only just touched the ground from my new job. The past few weeks I have been constantly looking at what I need to do next then what I need to do after that. Consequently I brought myself back to being mindful of the moment, appreciating the moment, loving the moment. Back to the day my girlfriends kindly came to support me through My third session Of chemotherapy I can see my surroundings as clear as day. I was in the first chair, David sat with me until they came. I felt fine, just wanted to get it over with. I wanted to show my friends how brave I was but didn't feel too brave by the end of the day !!! Jackie and Linda came and sat beside me. Tracey came a little later when she finished work. WE were chatting as you do and all was fine until the nurse tried to insert the needle for the chemo. To cut a long story short my veins had collapsed and she couldn't get the needle in. It was very painful - I broke down - not because of the pain but I felt out of control. It had to be done so she had to force it in. My friends were there at the right time and Jackie fell immediately into the role of nursing - caring - calming and really she softly talked me through the next half hour. She knew exactly what to say and do to comfort me. The nurse advised me that my veins would not stand another session so she rang the surgeon there and then to book me in for A portal to be inserted under my skin on my chest with a tube linking to the vein in my neck where the needles could be inserted in the future. Yeay !!! I'll look forward to that. After the chemo was done I was led upstairs with the girls to my hospital room. I put on my jams and sat on the bed and we chatted over coffee. Every little twinge I was waiting for the headache and sickness to begin And it did. I could feel it coming, swirling around in my head. I started to pace the room. The girls were trying to comfort me but I just wanted to b alone. The nurse came in and I was getting angry. I pulled off my wig in frustration - not realising and forgetting the girls were in the room - I think they were shocked to see me bald. Tracey left the room which made me realise it was upsetting for them. I stressed it would be better for them to go - we hugged and they left. Things got worse and no matter what the nurse gave me I could not stop vomitting. It got to midnight and she had to call in the oncologist (not my regular one). He was so kind and lovely. He put me on a syringe driver which stopped the sickness but knocked me out for 2 days. I just kept waking up when my meals were brought in but fell back asleep before I could eat them. It did wonders for the diet. There were periods of time when I would not be asleep but unable to move. I would just lay there thinking about events good and bad that had happened to me over the years. What else can you do? Your mind wanders from one thing to another. Did I actually do that ? What made me say that? What has happened to her/him? What are they doing right now while I am laying here thinking? Why had I taken for granted the fab places I had been to with my job - Dubai - Italy - Egypt - USA - parties on the beach - party by moonlight at the bottom of the pyramids - totally amazing. We also had some amazing experiences with David's job. He once ran the Mercedes Benz dealership in Manchester and often held events. David Beckham amongst others bought a car from him - I mean of course they weren't mates but they were quite friendly and he would attend any of the events at the garage. One of the events he came with Brooklyn - he was about 2 - I had to look after him in the office. We chatted for ages and he gave my son christopher a signed England shirt. We were once using his car and I found a love letter in the glove box to posh spice. David had a hissy fit and made me put it back. He gave us free tickets to the Man U games and we were invited to the players bar afterwards. This is ME - Jane from Woodside lol . There was a crowd of us at the England/Greece game when Beckham scored the famous goal - the atmosphere was amazing. We once went to the OK magazine charity ball - all the Man U players were there. I was sat next to Carol Vorderman and Gary Neville - we had such a laugh. By the end of the night I was very tipsy, me and one of the other wives whom I got along with soooo well were dancing and laughing. She said "Jane, teddy Sherringham can't take his eyes off you". I couldn't believe it. I was trying so hard to do my best sassy dance, then I realised I had been to the loo and not pulled down the inside of my dress, exposing my knickers to the world and teddy Sherringham. My immediate thoughts were why hadn't I put that lacy thong on - instead I chose the Spanx which pulled right up under my armpits. I was mortified - Teddy laughed, picked me up and carried me to the loo. I have added a picture of David with David Beckham in the dealership. 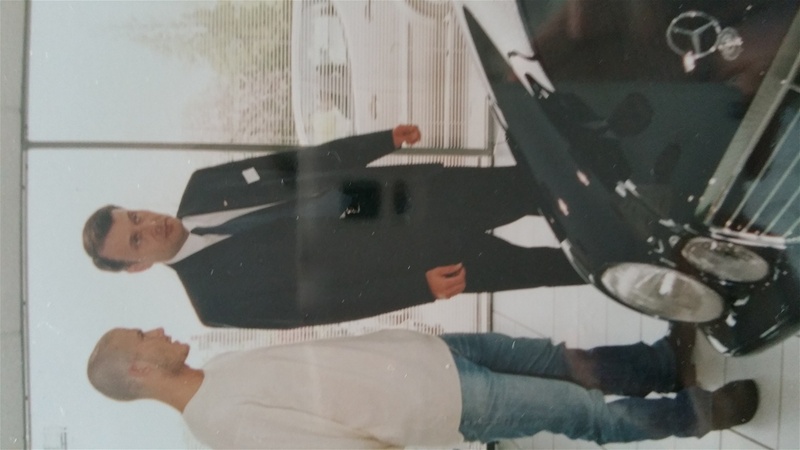 After a few years there he moved to Leeds and was in charge of the Porsche and Ferrari dealership Which brought a whole set of new experiences. Those were the days. Now I was waiting to go home and recover before the next session.